I think I want a bed cover for the new 2018 Titan XD we just bought. I have never owned one nor been around one to be honest. The truck will be used to pull a gooseneck and we do haul taller items from time to time. That said I am thinking a retractable cover is the way to go. Will these be water proof when closed? I would like opinions/advice from those with experience and I am open to type/brand suggestions. Should be dang close to water proof if you spend up on a good one. I'd also be looking at a trifold type cover. Bakflip seems to be the most popular. Neighbor has a retrax retractable cover and likes it as well. I'm a soft tri-fold cover kind of guy. You can look at the Tyger brand covers on Amazon, can have it to your door for about $230. I had one on my F150 for 3 years and it worked great. Best part is you can take it on/off by yourself with no tools in about 2 minutes. I wanted the retrax.. but it takes up too much space (i would have to get rid of my inbed toolbox...and the price point is hefty. I went with a flex and been very happy with it. I have a trifold on our Ram. It is one of only about 3 made for our truck but it works great, it’s very easy to fold, and it has not leaked at all in the month that we have had it installed. I have an Extang on mine and love it. It is a trifold, I can open from front of bed (to access a in bed tool box) or back of bed. you can also completely remove it for full bed access in about 30 seconds. It will support 300 lbs standing on it also. I just installed a bakflip on my wifes F250 last month and it has worked great. She drove through a downpour for about 15 minutes and it leaked all of about 3 tablespoons of water. I would say that's pretty dang good. I talked her out of the retrax type for 2 reasons: cost and bed space. I wouldn't get a tri-fold bakflip again. I currently have one and I have had it replaced twice due to the joints coming apart and sagging very badly. The current one I have is past the warranty date and it looks horrible. The other bad thing is when folded up you can't see squat out the back window. I am looking at the Bakflip revolver now. It rolls up instead of folding. i have a roll-n-lock and really really like it. Only down side is the tool box issue that the others stated with the retrax... oh well... I still like it and couldn't do without it. This, plus the backflip cant sit all the way up for me- scratched the cab. It leaks some water. Almost all the reasons I chose it were negated by the crappy design/build. Mine hasn't sagged yet thankfully. Did fade really bad. Would not recommend them at all, and personally will never buy anything made by them again. Retrax. Its a bit pricey but it's worth it. X2...Its never been 100% rain proof, but good enough to keep bags of corn and protein dry. I had a retractable and it was good beside the no tool box thing as mentioned but you could always go with a rat pack of some sort. my dad likes his tri fold but just uses his bed for hauling tools and stuff around. I don't have one now but wish I did sometimes to keep thieves away since I have a tendency to forget it aint like it used to be and leave things in the bed of my truck. I would check out paragon bed covers. I cant explain the design simply on here but it is interesting and can be taken off quickly. When I first saw them I thought it was a good idea but wasn't sure how it would hold up but I have read almost all positive reviews. Hunt In: Lampasas and anywhere else I can! Love my retrax. It does leak a little when parked in the rain but not a lot. Just enough to get the corners by the tailgate a little wet but it is minimal. First bed cover I have ever had and live being able to lock up everything and be able to walk into the gas station on the way to the lease and not worry about someone grabbing something out if the bed while I'm inside. it is pricey, but i use it every day and am very happy with it so far. i bought the divider for the bed too. I believe you're right on target with your needs being a retractable cover. Good ones are "water proof" and more durable. I have been using a backflip the last 3 years. It's great as well, but not as great as a true retractable for the 5th wheel or when needing most of the bed for larger hauling. When the last panel is lifted vertically, the entire rear window view is blocked. I have a Gator cover on my 2016 F150. I have had several “tonneau” clover styles and this one is by far the best so far. It has an internal lock and keeps it fir so no water pools and rolls pretty tight to open the whole bed up. It’s been great since I got it. I love my roll lock and yes it's water resistant. I had chairs and luggage in back in a 3in rain and nothing was wet. I had the back flip on my last truck but didn’t like it because if I had it all the way up I couldn’t see through my back window! Lots of good info, I appreciate it. I will not have a toolbox in this truck, its going to more of a family travel vehicle and to pull the GN trailers when needed. Seen some good reviews and the Diamondbacks. They are nice and sturdy with many additional add ons. Been looking at them but they are kinda pricey at around $1300-1400 staring out. I have narrowed itdown the Retrax and the RollnLock. A friend has the Retrax and a coworker has the RollnLock. Both happy and have good things to say just as said here. I am leaning towards the Retrax power model, but still reading reviews on both. I see models that are aluminum and others polycarbonate. I am guessing aluminum would be the better way to go? Any thoughts on the manual model vs the power model? Last edited by brushtrooper; 07-03-2018 at 07:51 PM. I just bought a Retrax. Later this summer they are supposed to be coming out with rails that have a T-Slot so you can put roof rack type attachments over it and still be able to open and close the cover. I hope this is not distracting from the OP's question. 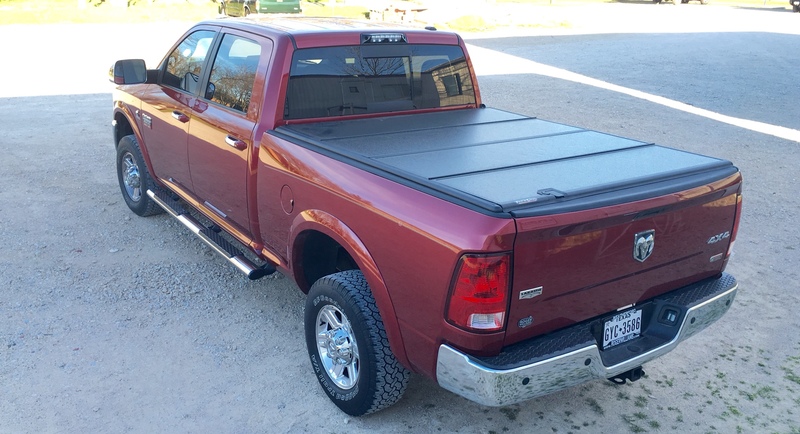 Anyone have feedback on the Truck Cover USA rolling cover? It seems to get good reviews and takes up less bed space according to their website. I just don't see as many reviews compared to the Retrax or Roll N Lock. I was wrong . Mine is a roll-n-lock . Aluminum is the way to go from the research I did . I am glad you brought that up. This one looks interesting. I like the rack option they offer too. This... I have this on my Ram and LOVE it. I still have plenty of room for my 5th wheel hitch too. I have the Fold a Cover G4 Elite on mine. Completely rainproof, foldable up to the front section, lockable and opens front or rear. You can also get their tool caddy that goes with it. I was going to get the bakflip but like someone else said, you can’t see anything out the back window when it’s flipped up. My 5th wheel hitch fits under it when closed.